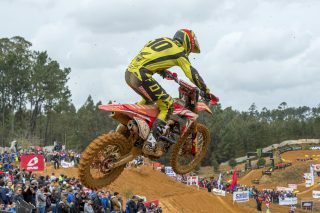 The rain-affected Agueda track in Portugal, ended up producing an excellent weekend of racing, with Tim Gajser making a welcome return to the podium after Mathys Boisrame had won both of his EMX250 motos. 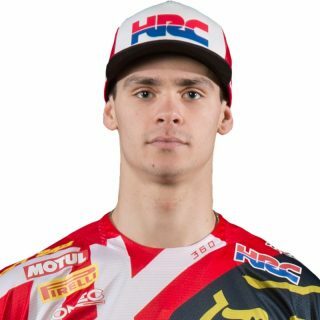 It was another positive step for Team HRC’s Gajser who rode extremely well on the difficult and rutted track, going three-five and continuing his rise up the MXGP championship standings. On an afternoon when making mistakes was so easy, Gajser’s smooth style allowed him to navigate the terrain without any problems and his delight at getting back on the box was evident for all to see. 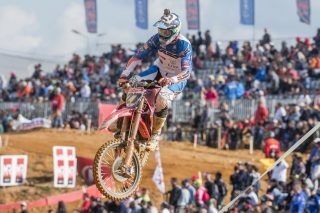 Arminas Jasikonis and Petar Petrov also scored points on-board their Assomotor machines as they continue their progression in this strong field. 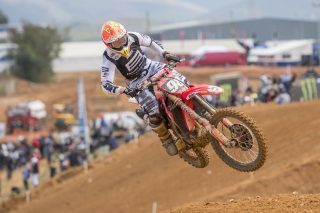 Calvin Vlaanderen led the Honda charge in the MX2 class, with an impressive sixth place in the second race after another good start on his CRF250RW. 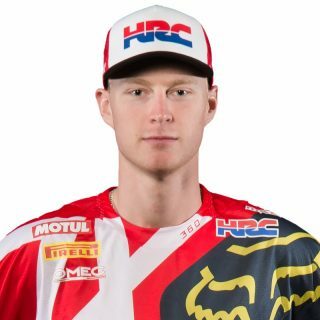 Bas Vaessen put his 114 Motorsports Honda inside the top 10 in the first moto, with Martin Racing’s Michele Cervellin just behind in 11th after a good battle between the two riders. 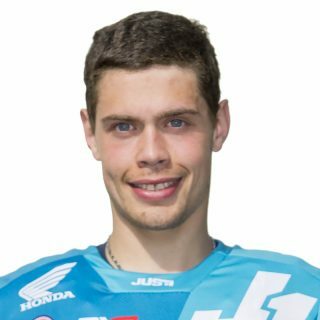 Unfortunately the Vamo Racing pair of Marshal Weltin and Micha-Boy de Waal both had to pull out of a moto, but de Waal was able to score his first points of the season in the second race when he came home in 18th. 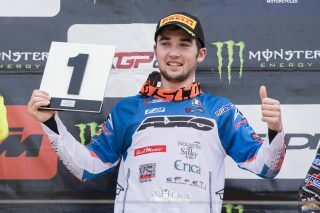 In the EMX250 championship, Assomotor Racing rider Mathys Boisrame put in two great rides after two holeshots, to win both races in completely different conditions. 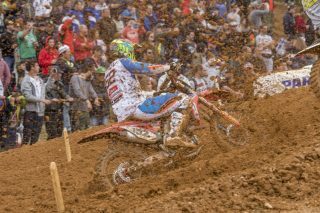 In the rutted hard pack on Saturday and the muddy conditions of Sunday morning, Boisrame showed he was the best rider of this extremely competitive field and with his 50 points, moved himself right up into title contention. 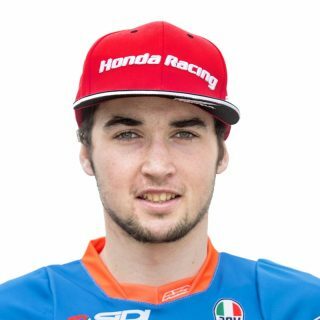 He now sits just 15 points behind the championship leader and with Russia being one of his favourite tracks, he has a good chance to close the gap even further at the next round. 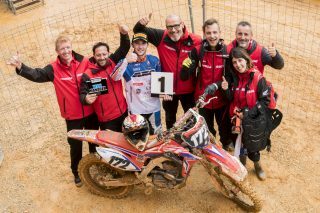 Elsewhere in the class, Alberto Forato and the Carglass Honda duo of Freek van der Vlist and Steven Clarke all scored points. The riders now have a weekend off before making the journey to Russia where the action will take place on the Monday and Tuesday, in order to coincide with the May 1st Russian National Holiday. Obviously I’m really happy to be back on the podium. I felt good throughout the weekend: the track was very technical with many lines available, and I enjoyed it a lot. 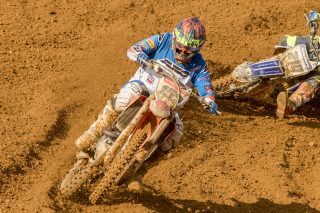 I got a good start in race one and I was able to follow Jeffrey but Toni passed me with two laps to go. My jump in race two was not as good and I got caught in the middle of the pack, then I almost crashed at turn two. Fifth place was enough for the podium, so I’m happy. This is a very important result after a rough start to the year, so I want to thank my team who helped me getting back near the front. I feel like our season is starting now, so I look forward to Russia. It was a good weekend with two very good races. 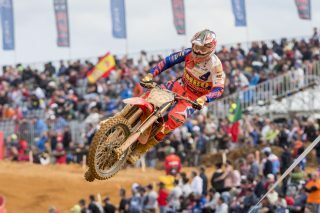 I got a great starts and I felt really comfortable on the Honda all weekend. I got two holeshots I believe, which was important because all the mud made the track very difficult in race two, so I am very pleased with how it all went. I am really excited to go to Russia now, because my confidence is high, I like the track and with this result I have moved into fifth place in the championship. Again, not the weekend we wanted. 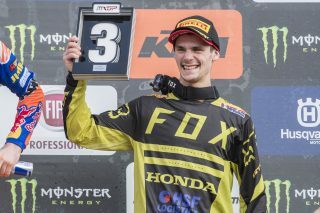 The goal was to be consistent and have two good motos, but that wasn’t the case. 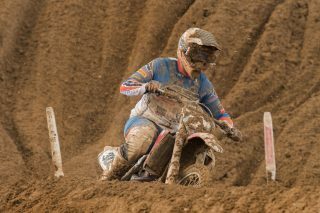 I went down quite hard on the wave section in race one, then I picked the bike up but went down again afterwards. I wasn’t riding like I normally do, and the shoulder gets really tired after 10-15 minutes so it’s not easy to ride especially with the track being so rough. 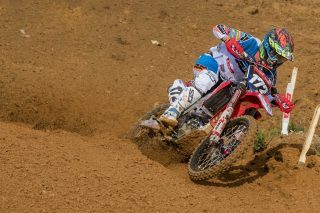 We got a good start to the second moto and I managed to get a sixth-place finish. It was good to wrap up race day with a better result, but we’re obviously looking for more. I had a so-so weekend. 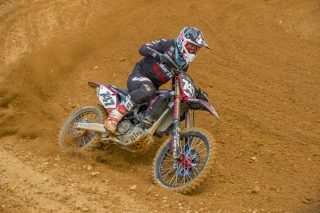 The speed wasn’t too bad but in the first moto I didn’t find a good feeling and I finished 11th. It’s not super, but still a decent amount of points as I make my way back into the championship. 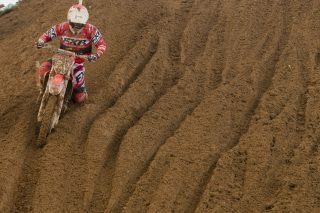 The second moto started better as I was around eighth or ninth but then I made a mistake and crashed. The pain was pretty bad and I thought about pulling out of the race, but I was still in a points scoring position so I stuck it out and finished the moto. I hope for a bit more luck at the next round in Russia. The weekend definitely had some ups and downs. 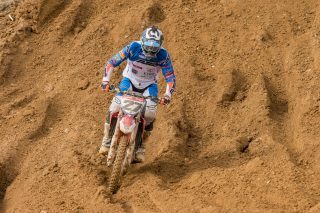 Yesterday in the qualification race I felt so good, I didn’t even push too much because I had a little problem with my goggles. Today was the complete opposite though as I just couldn’t find any rhythm. 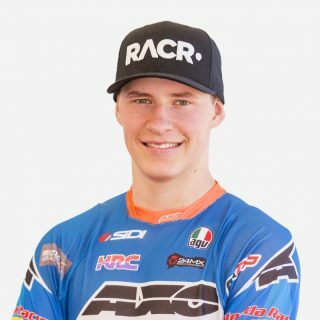 In the first moto I made a big mistake and landed on my leg, and then I had one more crash so I just decided to pull out and concentrate on the second race. I did ok off the start in the second moto, I was inside the top 10 I think but I couldn’t find the flow or a good speed, and ended up 15th. I’m not happy about that but I know I can do better and I just want to put everything together like I know I can. 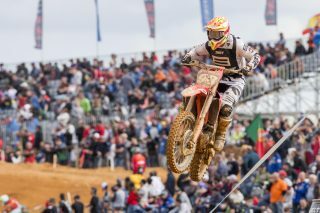 The highlight of the weekend for me was Mathys Boisrame winning both races convincingly in the EMX250 championship. 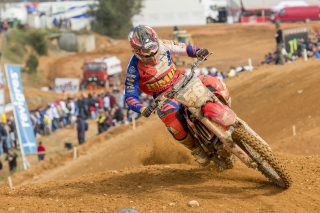 Mathys pulled two holeshots, confirming the strength of the new Honda CRF250R, before mastering the technical conditions better than anyone else. 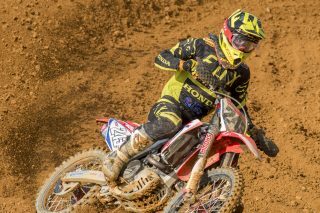 With those results he rocketed himself into the top five of the points standings, just 15 behind the leader. 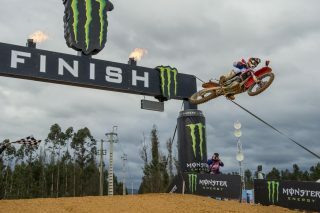 This was really wonderful to see and I think the next race in Russia will be very exciting for him. 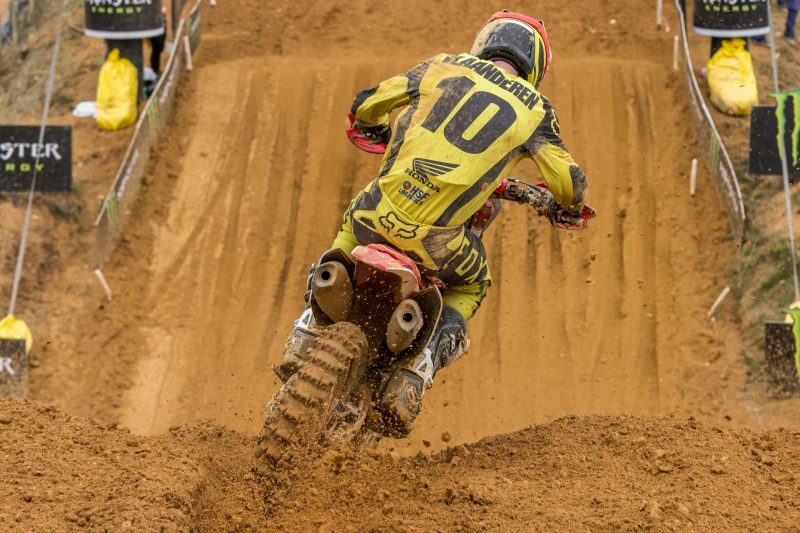 In the MX2 class we had a couple of good top 10 finishes, with Calvin Vlaanderen in sixth and Bas Vaessen in 10th. 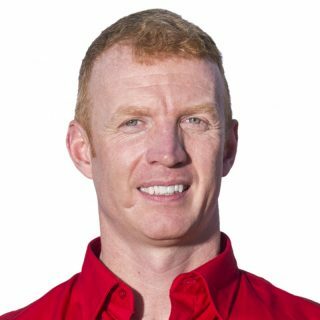 Michele Cervellin also managed an 11th place so all three contributed positively to their championship campaign. Micha-Boy de Waal also scored his first points of the season, so that was an encouraging first step and one that he can hopefully build upon. 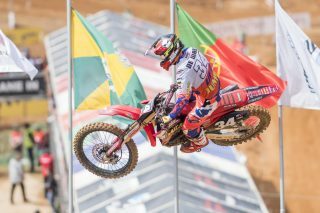 It was fantastic for Tim Gajser to be rewarded with third overall and a return to the MXGP podium for the first time this year. I’m hoping he can keep progressing, as he gets further away from the date of his recent injury. 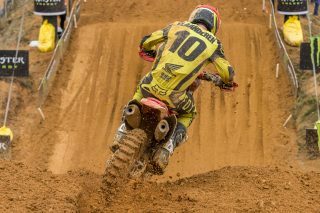 Arminas Jasikonis delivered a solid 15th in race two, although he felt some difficulty riding the challenging track. The aim for him is to try and turn his good speed into good race results. It will certainly be refreshing to get to the hard-pack track in Russia, after the tricky surface that we had here in Portugal. With a weekend off before, it should give our riders a good chance to prepare, for what should be an exciting round of action in all three classes.